I’ve said in previous blog entries – and elsewhere – that the failures are more fun to talk and write about than the successes. This one, as it happens, was an interesting success. Well, mostly a success. Just reading through the recipe, it was obvious this wasn’t going to turn out like just another gelatin dish. Besides Jell-O (any red flavor – I used raspberry) this one called for a can of jellied cranberry sauce, a cup of sugar, chopped nuts, and pectin, and with the additional gelling agent I guessed it was going to turn out with the consistency of Turkish delight. Sadly, it was exciting to be able to look forward to this change of pace. There were only two minor problems preparing this recipe. The first, not that much of a problem, really, was deciding what kind of nuts to use. The New Joys of Jell-O is consistently vague about nuts, as though they’re all the same, or possibly, going by my memories of the 1970s, “nuts” in this context was shorthand for walnuts. That’s a reasonable option in this recipe, but walnuts are not my favorite, so I went with pecans instead. The other problem had to do with the pectin and was another of those “this book is a little outdated” things. The recipe calls for a half of a bottle of Certo pectin and does not mention a specific amount, but Certo pectin no longer comes in bottles but in plastic pouches. Each pouch is enough to make some standard-sized amount of jelly or jam, and I guessed that back in the day the bottle had contained the same amount of pectin, so I emptied a pouch into a measuring cup and used half (a quarter-cup, in case anyone’s wondering). Judging by the result, I was probably right. Yay me! The preparation was pretty simple and mostly involved a lot of stirring. The jellied cranberry sauce was beaten until the shape of the can was completely obliterated and it was as smooth as I could get it, then brought to a boil. The dry ingredients were added and it simmered for ten minutes with frequent stirring. It came off the heat for the addition of the pectin and nuts and then had to be stirred constantly as it cooled for ten minutes to prevent the nuts from floating to the top. This sounds tedious, but actually it was a pleasure. The mixture smelled lovely, and it was a beautiful deep garnet color that made me happy while I was working. The mixture went into a lubed square baking pan (the recipe says “buttered” but I wasn’t sure I wanted that strong a flavor so I used the nonstick spray) and chilled overnight. I was supposed to be able to turn this out onto a piece of wax paper (which we don’t have, so I was using a baking sheet) covered with sugar (to coat the candy to prevent stickiness,) but despite the nonstick spray and immersion in a hot water bath, the candy would not come out of the pan. No matter. I used the cubed gelatin technique, cut it while it was in the pan and removed the cubes with a cookie spatula, and this was completely satisfactory. 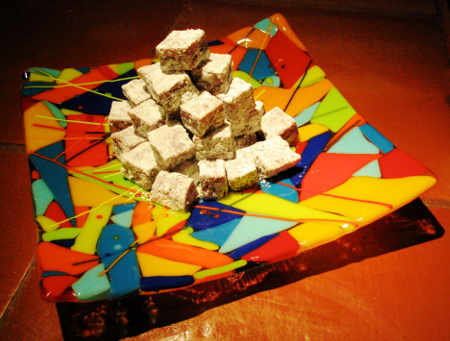 Because this resembled Turkish delight, I used powdered sugar to coat the candy. The recipe offered Baker’s Angel Flake Coconut as an alternative to sugar, and I like coconut so I bought a bag, but the way the coconut was clumping (not dry enough) I thought it wouldn’t stick well to the candy or serve the intended purpose. The recipe said to coat the candy with sugar, and after an hour add another coat to prevent sticking. This I dutifully did, and due to time constraints (it was bedtime) I took the photo right after I’d added the second coat. What happened overnight, and what happened to the third coat as well, was that the moisture in the candy dissolved much of the sugar, making a sort of cran-raspberry royal icing. So it didn’t look very appetizing for most of its life, but it did taste good. Bryan ate it voluntarily. Just for kicks and giggles I tried coating some of it with coconut and found I’d been right – some of it stuck, but not enough. It still tasted good. Since this was a dish that would travel well, I brought a good-sized portion to the Lab, hoping to elicit some fresh opinions. I didn’t push it on anyone, and only a few brave souls, my bestest friends in the Lab, tried it. One found it too sweet. The person who ate the most was the person with the amazing metabolism who will eat almost anything when he’s hungry. The most valuable feedback was from our Turkish student, who confirmed that it was like Turkish delight, and also confirmed for me that Turkish delight is, in fact, Turkish. I had been in some doubt, because I had first heard of Turkish delight when I read The Lion, the Witch, and the Wardrobe and thought maybe it was a name given to some British confection to make it sound exotic. Anyway, she seemed to like it, but not that much, and I ended up bringing a good bit of it home. Bryan and I ate it all up. No waste this time.